Do you have the same personalizing possibilities for a virtual event than with a physical event? Yes, adjusting the design, booths, functions and advertising spaces are possible. However, do not forget that you are not trying to reproduce the same traditional business model in your virtual events. To understand it a little better, discuss it with our team and they will share some of the best practices of virtual events. What are some of the prerequisites to assist to a virtual event? A computer, a tablet or a smartphone connected to the internet will be indispensable in order to visit a virtual event. A webcam, a microphone and a headset (or a speaker) are required but not as indispensable to the platform. However, in order to profit from advanced chat functions, as well as for the retransmission of a conference, these are indispensable and essential. From what media can/do I access your virtual event platform from? We have developed two platforms: a FLASH version and an HTML5 version. The FLASH version is only available on computers (PC & MAc). 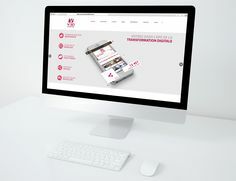 As for the HTML 5 platform, it has been developed in order to be accessible from computers but also on other media such as smartphones and tablets (Apple & Android). The responsive design technology allows for perfect adaptability to all media. In addition, you will not require an application to take advantage of our virtual event solution. How much time is needed in order to prepare/organize a virtual event? Even if you will have very little logistics (location/rental space, various supplies, security, insurance…) and since everything happens on your computer, tablet or smartphone, a virtual event still requires some organizational skills. In order to make your event a success, we recommend that you begin organizing it at least 3 months in advance. In terms of Capacity, what are the limits regarding my virtual events? The number of halls that you can integrate into the platform is unlimited. You can create as many as you like, allowing you to organize your booths by themes. To ensure the platform operates properly, the assigned quantity of data for each event is limited to 5gb. You can increase the limit, any time, if necessary. In regards to the limitations and in terms of the number of visitors simultaneously connected to an event, there is a maximum of 350 people. Above this maximum, visitors will be directed to a waiting list. Regarding Conferences, there is a limit of 150 simultaneously connected people in order to ensure fluidity as well as to ensure the quality of exchanges between speakers and visitors. How to effectively communicate around my virtual event? It’s simple, make some noise! This requires you to set up a communication network to allow for better visibility around your virtual event and contribute to your credibility as an organizer. Even if your event is virtual, ideally, communication must also be both online and offline. In order to assist you throughout this communication phase, V3D Events has designed the booster pack: an online key tool on hand to support your communication with your employees, exhibitors and visitors during the launching phase of your virtual event. It’s ideal if you need a tool to measure the responsiveness of your clients and collaborators towards this concept, or if you wish to advertise around your upcoming virtual event; or even if you want to demonstrate the virtual event platform. Would a virtual event have a negative impact on my physical event? Not at all. 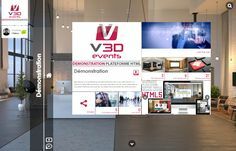 V3D Events objective is to increase and enrich a physical event’s lifetime allowing it to spread via a virtual event, which is accessible around the world at any time. There is no difference of impact whether it may be at a fair, lounge, congress, roadshow or even an internal event. Additionally, virtual events allows you to link together a digital community surrounding your chosen theme. The virtual offers the possibility for visitors unable to physically attend the event, to nonetheless access various contents, meet different exhibitors while also avoiding the constraints of the physical event. How to profit from my virtual event? There are many available options in order to maximize profitability from your virtual event. On one hand, you have the possibility to sell your placements to some exhibitors. On the other hand, the advertising committee integrated in the platform allows you to easily manage the various advertisements present in your event. Therefore there is a possibility to commercialize advertising spaces to whomever may be present or visible in the virtual event. Where may I find the rates regarding the booths and advertising spaces? V3D Events is a virtual event operator, which means that it places organizers under a licensing mode called SaaS. Therefore, as we are not the sole organizers of the Virtual Events, we do not have any specific rates regarding the booths and advertising space sales. Our numerous events on which we have worked with our clients allows us to guide you in order to help you maximize your investment. How can we contact you about possible improvements or new developments? In order to satisfy your needs, we appreciate any suggestions for improvements or developments that you come up with. As such, this will allow for our virtual event solution to evolve in order to better correspond with your needs and demands. Therefore, if you have any kind of observations in order to improve our solution, please do not hesitate to let us know about it. I am utterly lost, where may I find help? We have thought of everything in order for the V3D Events platform to be as ergonomic as possible. Meanwhile, the technical team remains at your service in order to best guide you around the virtual event solution. Additionally, PVA (assisted virtual production) credits are included in each packages, thus offering you constant company with a specialist. Therefore, you will benefit from assistance to configure your event, set up your booths, and configure settings but also to personalize your visual identity of the platform, slogans and sponsors. A user manual is at your disposal directly on the platform. There are some for exhibitors, speakers and visitors as well. VISIMMO 3D est une Jeune Entreprise Innovante qui a été créée en 2007, spécialisée dans la conception et la réalisation de solutions marketing innovantes et reposant sur l’utilisation de la 3D sur Internet.